I would like to make a clarification in follow-up to last week’s disgruntled comment about my garden woes. 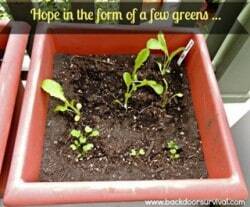 I actually do grow greens successfully on the little deck outside my office. They thrive in that location even though it only gets morning sun. Down on the patio or in my little garden, the critters and especially the deer, eat any and all tender greens..
Other critters (most likely the raccoons) have already dug up my cucumbers and the birds got to my peas. The only thing left are my tomato plants that are in pots I can move around to catch the sun and a lone zucchini plant I started in a large Rubbermaid tub. When I get back from Alaska, I am going to the nursery to pick up some herbs and flowers so at the very least, I will have something to enhance my purchased food plus something that is pretty to look at. So I have not given up 100%. 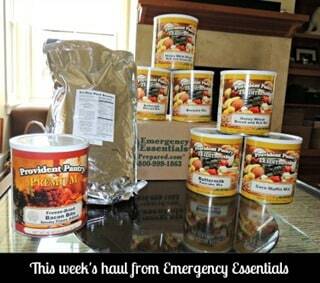 I stepped up my long term food storage this week with a large order from Emergency Essentials. Here is this weeks haul. Included are the Baking Mixes Combo, Shredded Hash Brown Potatoes, and Freeze-Dried Cooked Bacon Bits. 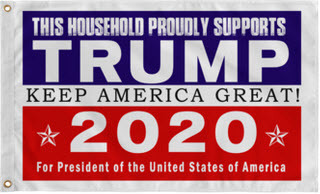 The latter will probably be long gone before we have a real emergency since I see a big fat baked potato with all of the trimmings in my near future. 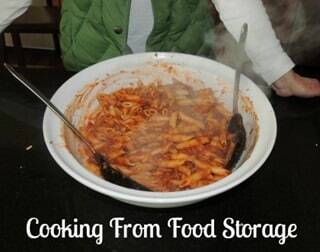 I also cooked up a big batch of pasta using 100% food storage: dried pasta (from the grocery), canned sauce, spices and herbs plus freeze-dried ground beef. And just so you know, if you are just getting started with FD food, I highly recommend FD ground beef. It works well in just about any recipe and is an excellent way to add protein to your meals. 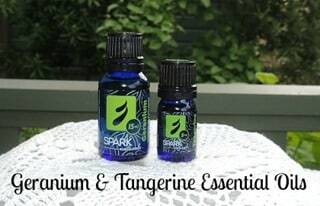 And finally, I have two new oils to learn about and use from Spark Naturals: Geranium and Tangerine. Perhaps in my diffuser? In addition to all of this shopping and cooking, I managed to install a new router and modem for my DSL network here at home. Thank goodness I “lease” my gear from Century Tel. That is not something I normal recommend but when it comes to DSL and broadband equipment, it is so worth it for good customer support (no finger pointing) plus, they sent the replacement gear to me at zero cost. Okay, enough about me. Let’s get on to the Sunday Survival Buzz. Here is this week’s reading list. As always, there is something for everyone. Gaye’s Note: This is on my must try list when I return from vacation. Could this be the answer to baking bread without yeast? Do you know how to build a Faraday cage? Hey what’s up? There were no tips in the mail bag this week. The following giveaways are still open and awaiting your entry. 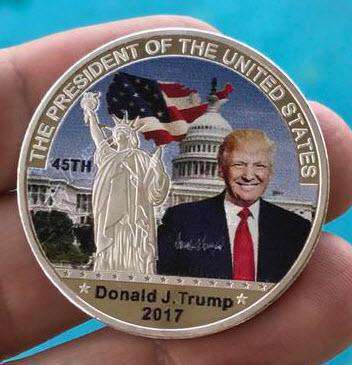 Remember, winners are selected at random. My giveaway questions are designed to make you think – nothing more. Question: Given the resources, where would you live to ensure your long term survival? A. I am all set the way things are – I am not going anywhere. B. I am staying in the same general area but moving to different home. C. I plan to get out of dodge and move to ____________________ . Answer: A – Staying where I am! I have not tallied all the responses yet but upon cursory review, I believe most BDS readers would stay put due to family,health or financial reasons. Or, if they are lucky, they are already self-sufficient and living on a rural homestead. The winner of the Cen-Tech from Harbor Freight is “George”. Question: You were just handed $100 to spend on prepping items. What would you purchase? Answer: I think I would buy the Cen-Tech 5 in 1. Sounds like a great combination of useful devices. A note about winners: Winners of the giveaways are always informed by email plus they are announced in the Sunday Survival Buzz. They have 48 hours to claim their prize from the time of the Sunday announcement. We had two no-shows for the AquaPod Deluxe Kit. Luckily, our 3 place winner checked in right away. Congratulations Amanda! Let’s give a Backdoor Survival welcome to our newest sponsor, Organized Prepper. This family-owned business carries several brands of storage food, emergency kits, archery & crossbow supplies, solar kits, water systems, camping equipment, and all kinds of other prepping gear. Shipping on orders over $50 is always free and you know how I love those free shipping deals! They also have a pretty neat little blog, too. As with all of my sponsors, please pay them a visit and let them know you saw them on Backdoor Survival. This week I have been diffusing Zen Grounding Blend. What is in it? Single essential oils of Spruce, Rosewood, Blue Tansy and Frankincense have been blended together to promote clarity, calmness and an overall feeling of balance. It smells lovely and is especially nice in a diffuser with a few drops of a citrus essential oil. I particularly like adding Wild Orange. 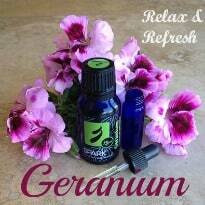 This blend helps everything, including blood cell function better but, mostly, it pulls me out of the daily doldrums and like magic, helps me feel like I have both feet on the ground and all is right with the world. And that, as you know, can be tough for a Prepper! Do you ever have a week that flew by and at the end of the week you felt like nothing got accomplished? Don’t feel bad – it happens to all of us and especially to me. ALL OF THE TIME! Think of it this way: you are in good company! What about you – what did you do to prep this week? Until next time, remember to make every day a prep day! Click Here To Vote For Me at Top Prepper Websites! Did you know you can vote once a day? When it comes to protection from radiation, a few things should be on hand. Here are some ideas to get you started. For more information, see Using Potassium Iodide Following a Nuclear Incident. Home Health Physics: Health Physics is the applied science of radiation exposure control, radioactive contamination control and environmental monitoring. This little eBook offers methods of keeping your home safe during those times when radioactive fallout or contamination might be threatening your neighborhood. It written by Joy and and Randall Thompson and David Bear and is a free download. iOSAT Potassium Iodide Tablets, 130 mg (14 Tablets): These were backordered for weeks at a highly inflated price-wise after Fukushima. Be sure to get a package now for each family member. The way these tabs work is that they fill the thyroid gland with potassium iodide, thus reducing the chance that harmful radioactive iodine will enter and cause sickness or cancer. NukAlert: Radiation Detector/Monitor:The NukAlert is a personal radiation meter, monitor and alarm that will promptly warn you of the presence of dangerous levels of radiation. It is designed to be attached to a key chain so that you can keep it with you at all times. Ambient Weather WR-089 Compact Emergency Solar Hand Crank AM/FM/NOAA Weather Radio, Flashlight, Smart Phone Charger with Cables: This reasonably priced radio is popular with Backdoor Survival readers. N100 Respirator Masks: You want the N100 respirator masks and not the less effective N95 masks. These two were in great demand after Fukushima so if you did not pick up a pack or two then, get them now. This Moldex 2730 is NIOSH certified to have a filter efficiency of 99.97% or greater against particulate aerosols free of oil. RADSticker nuclear radiation exposure determining dosimeter: The purpose of these stickers is to provide timely personal radiation exposure information in an event of an accident at a nuclear power plant or a nuclear or dirty bomb explosion. Low in cost, the RADSticker will help you determine whether you will need for medical treatment. 3M Duct Tape: Duct tape is an absolute necessity when sealing off a space to shelter in place. For this purpose you want something better than the cheap stuff you get at the dollar store. Emergency Air for Shelter-In-Place Preppers and Home Built Bunkers: Sheltering in place by sealing in a room is problematic at best since your supply of breathable air is limited. The system detailed in this book allows anyone to breathe safely while under threat and while following FEMA guidelines for sheltering-in-place. The Baking Mixes Combo is currently on sale for for $51.99 or 29% off. The selection in this combo pack includes Buttermilk Biscuit Mix, Wheat Bread Mix, White Bread and Scone Mix, Cornbread Muffin Mix, Buttermilk Pancake Mix, and Chocolate Fudge Brownie Mix. 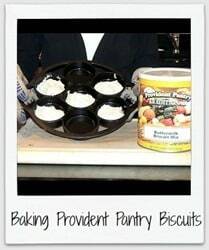 I have mentioned a number of times how much I really love the Provident Pantry Corn Muffin Mix and the Buttermilk Biscuit Mix. Both of these are included in this combo pack. Next up to the “to try” list are Brownies! The Sunday Survival Buzz Volume 116 by Gaye Levy first appeared on Backdoor Survival.